THE PRESIDENT: Good morning. Welcome to the White House. A week ago on Memorial Day, the flag of the United States flew in half-staff in tribute to those who fell in service to our country. Today we pay special homage to one of those heroes: Private First Class Ross Andrew McGinnis of the U.S. Army. 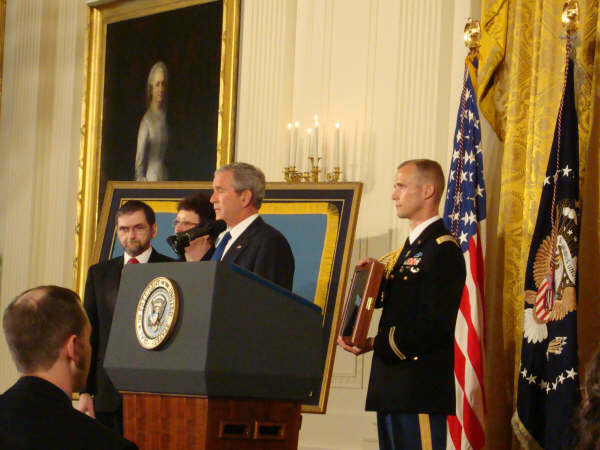 Private McGinnis died in a combat zone in Iraq on December the 4th, 2006 -- and for his heroism that day, he now receives the Medal of Honor. In a few moments, the military aide will read the citation, and the Medal will be accepted by Ross's mom and dad, Romayne and Tom. It's a privilege to have with us as well Becky and Katie, Ross's sisters. I also want to thank the other distinguished guests who have joined us: Mr. Vice President; Secretary Jim Peake of Veterans Affairs; Secretary Pete Geren of the Army; Secretary Michael Wynne of the Air Force; General Jim "Hoss" Cartwright, the Vice Chairman of the Joint Chiefs. I appreciate other members of the administration for joining us. I want to thank members of the United States Congress who have joined us today: Steve Buyer, John Peterson, Louie Gohmert. Thank you all for coming. I appreciate the Chaplain for the prayer. We welcome friends and family members of Ross, as well as members of the 1st Battalion, 26th Infantry, including Charlie Company, that's with us today. We're also joined by Private McGinnis's vehicle crew -- the very men who witnessed his incredible bravery. We welcome Sergeant First Class Cedric Thomas, Staff Sergeant Ian Newland, Sergeant Lyle Buehler, and Specialist Sean Lawson. A special welcome to the prior recipients of the Medal of Honor, whose presence here is -- means a lot to the McGinnis family. Thank you for coming. 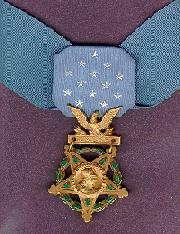 The Medal of Honor is the nation's highest military distinction. It's given for valor beyond anything that duty could require, or a superior could command. By long tradition, it's presented by the President. For any President, doing so is a high privilege. Before he entered our country's history, Ross McGinnis came of age in the town of Knox, Pennsylvania. Back home they remember a slender boy with a big heart and a carefree spirit. He was a regular guy. He loved playing basketball. He loved working on cars. He wasn't too wild about schoolwork. (Laughter.) He had a lot of friends and a great sense of humor. In high school and in the Army, Ross became known for his ability to do impersonations. A buddy from boot camp said that Ross was the only man there who could make the drill sergeant laugh. Most of all, those who knew Ross McGinnis recall him as a dependable friend and a really good guy. If Ross was your buddy and you needed help or you got in trouble, he'd stick with you and be the one you could count on. One of his friends told a reporter that Ross was the type "who would do anything for anybody." That element of his character was to make all the difference when Ross McGinnis became a soldier in the Army. One afternoon 18 months ago, Private McGinnis was part of a humvee patrol in a neighborhood of Baghdad. From his position in the gun turret, he noticed a grenade thrown directly at the vehicle. In an instant, the grenade dropped through the gunner's hatch. He shouted a warning to the four men inside. Confined in that tiny space, the soldiers had no chance of escaping the explosion. Private McGinnis could have easily jumped from the humvee and saved himself. Instead he dropped inside, put himself against the grenade, and absorbed the blast with his own body. By that split-second decision, Private McGinnis lost his own life, and he saved his comrades. One of them was Platoon Sergeant Cedric Thomas, who said this: "He had time to jump out of the truck. He chose not to. He's a hero. He was just an awesome guy." For his actions, Private McGinnis received the Silver Star, a posthumous promotion in rank, and a swift nomination for the Medal of Honor. But it wasn't acclaim or credit that motivated him. Ross's dad has said, "I know medals never crossed his mind. He was always about friendships and relationships. He just took that to the ultimate this time." When Ross McGinnis was in kindergarten, the teacher asked him to draw a picture of what he wanted to be when he grew up. He drew a soldier. Today our nation recognizing -- recognizes him as a soldier, and more than that -- because he did far more than his duty. In the words of one of our commanding generals, "Four men are alive because this soldier embodied our Army values and gave his life." No one outside this man's family can know the true weight of their loss. 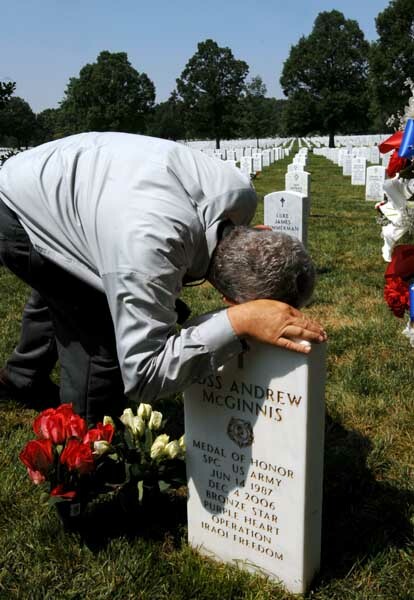 But in words spoken long ago, we are told how to measure the kind of devotion that Ross McGinnis showed on his last day: "Greater love hath no man than this, that a man lay down his life for his friends." Gospel also gives this assurance: "Blessed are they that mourn, for they shall be comforted." May the deep respect of our whole nation be a comfort to the family of this fallen soldier. 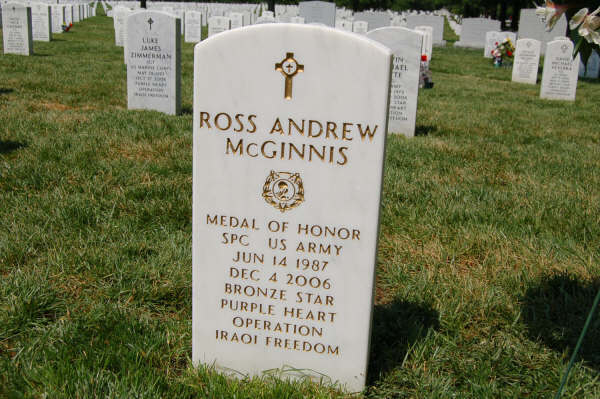 May God always watch over the country he served, and keep us ever grateful for the life of Ross Andrew McGinnis. And now I'd like to invite Mr. and Mrs. McGinnis to please come forward for the presentation, and the military aide will read the citation for the Medal of Honor. 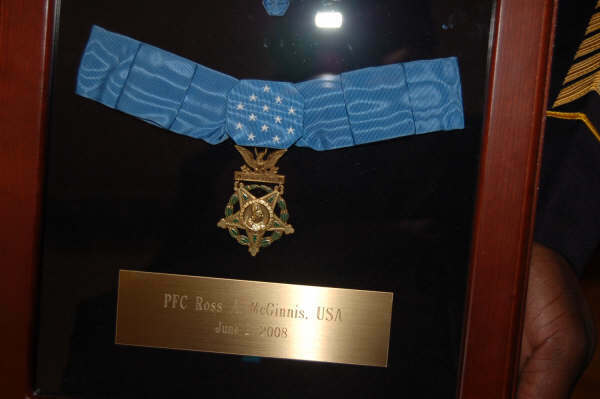 "The President of the United States of America, authorized by act of Congress, March 3rd, 1863, has awarded in the name of Congress the Medal of Honor to Private First Class Ross A. McGinnis, United States Army, for conspicuous gallantry and intrepidity at the risk of his life above and beyond the call of duty. Private First Class Ross A. McGinnis distinguished himself by acts of gallantry and intrepidity above and beyond the call of duty while serving as an M2 .50-caliber Machine Gunner, 1st Platoon, C Company, 1st Battalion, 26th Infantry Regiment, in connection with combat operations against an armed enemy in Adhamiyah, Northeast Baghdad, Iraq, on 4 December 2006. "That afternoon his platoon was conducting combat control operations in an effort to reduce and control sectarian violence in the area. While Private McGinnis was manning the M2 .50-caliber Machine Gun, a fragmentation grenade thrown by an insurgent fell through the gunner's hatch into the vehicle. Reacting quickly, he yelled "grenade," allowing all four members of his crew to prepare for the grenade's blast. Then, rather than leaping from the gunner's hatch to safety, Private McGinnis made the courageous decision to protect his crew. In a selfless act of bravery, in which he was mortally wounded, Private McGinnis covered the live grenade, pinning it between his body and the vehicle and absorbing most of the explosion. "Private McGinnis' gallant action directly saved four men from certain serious injury or death. Private First Class McGinnis' extraordinary heroism and selflessness at the cost of his own life, above and beyond the call of duty, are in keeping with the highest traditions of the military service and reflect great credit upon himself, his unit, and the United States Army." 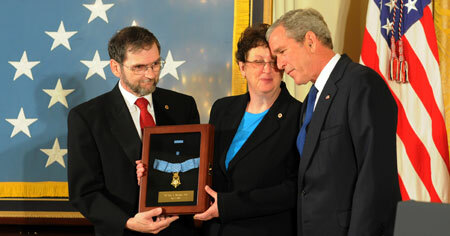 The Medal of Honor is presented. For a video of the ceremonies, please click here. 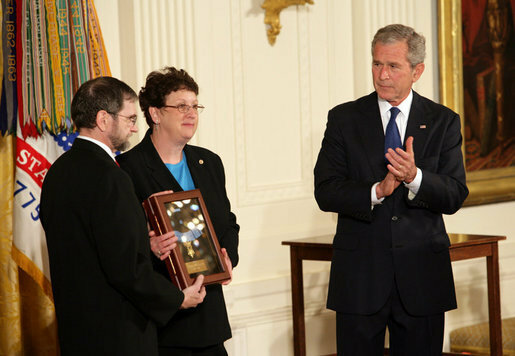 President George Bush presented the Medal of Honor to the parents of U.S. Army Spc. 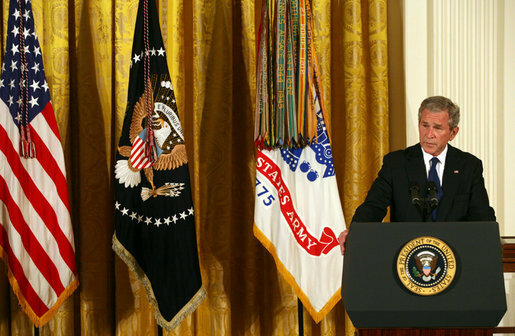 Ross A. McGinnis during a ceremony at the White House this morning. 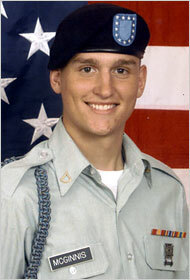 McGinnis, 19, of Knox died December 4, 2006, from wounds he suffered when he threw himself on a grenade in his Humvee while on patrol in Baghdad. That action killed him instantly, but saved four other soldiers in the vehicle. 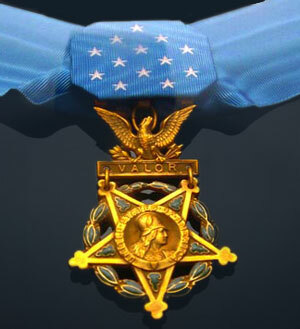 The Medal of Honor is the nation's highest award for bravery in combat. Before Bush presented the medal to McGinnis's parents, Tom and Romayne McGinnis, of Shippenville, Clarion County, he leaned over and spoke privately to Romayne, she said after the ceremony. "He said, 'Don't cry, or I'll cry,'" Romayne McGinnis said. Tom McGinnis said his son "did the right things at the right time." He added: "If by some miracle he'd had survived, he would have had a good time today." 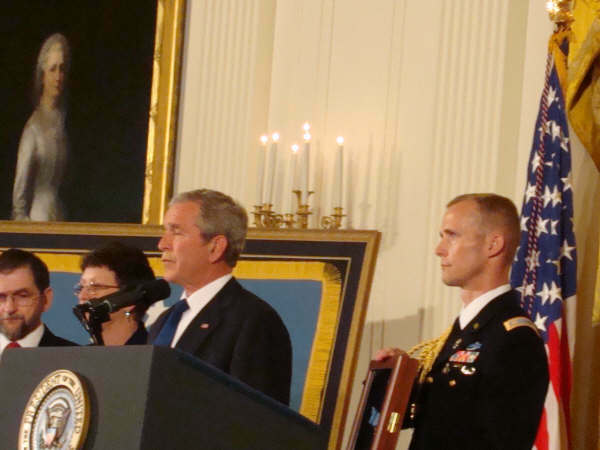 WASHINGTON - A Clarion County soldier was inducted into the Pentagon's Hall of Heroes on Tuesday, one day after he was posthumously awarded the Medal of Honor by President Bush. 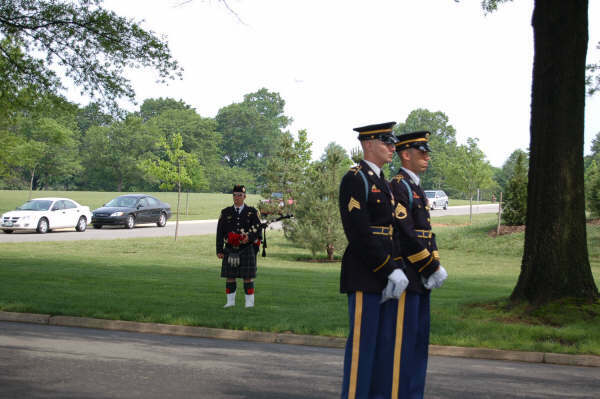 The solemn honors for Army Private First Class Ross A. McGinnis will continue today with the unveiling of a headstone at his gravesite in Arlington National Cemetery. McGinnis, 19, was killed on December 4, 2006, in Iraq when a grenade was thrown into the Humvee where he and four other soldiers sat. In a split-second decision, he jumped on the grenade, giving his own life while saving the others. The Hall of Heroes is a shrine to the nation's most honored soldiers. Inside the hall, glass cases enclose the three versions of the Medal of Honor - the Army version; the sea-going version for the Navy, the Marine Corps and the Coast Guard; and the Air Force version, according to the Pentagon. Thousands of thin, silver metal strips, each engraved with the name of a Medal of Honor awardee, line the four brown wooden walls in long columns. The induction ceremony for McGinnis was held in the Pentagon conference center and was attended by the soldier's family members and friends. Remarks were made by Gen. Richard A. Cody, the vice chief of staff of the Army; Pete Geren, the secretary of the Army; and Gordon England, the deputy U.S. secretary of defense. McGinnis' father, Tom McGinnis of Shippenville, also spoke during the program, taking the opportunity to urge passage of a new GI Bill that is being debated in Congress. The measure, which has been passed by the Senate, would expand education benefits for veterans who have served at least three years in the military after September 11, 2001. Some lawmakers opposed to the bill say it would encourage too many to leave the military, therefore reducing retention rates. The president has threatened to veto the measure. The elder McGinnis said the expanded benefits would be a terrific help for military personnel and would represent a way to support the nation's troops. They need our support, he emphasized. He said the bill would help power the U.S. economy for a good many years. And, he said the measure approved by the Senate is "what we need," as opposed to an amended version of the legislation. He further suggested the nation send gifts and letters to the troops "and remind them they are appreciated." "And they will be welcomed when they come home," he said. While military personnel put their lives on the line for us, McGinnis said, they "are afraid of the things they will be called on to do. They all experience homesickness and miss the comfort they've given up." As for his son, the reason he's no longer here is that "his buddies were more important than life itself." McGinnis said he and his family have appreciated all the memorials, gifts and special attention they have received, noting "it has helped enormously." McGinnis' wife, Romayne, was also at the program. For a video of the ceremony, please click here. 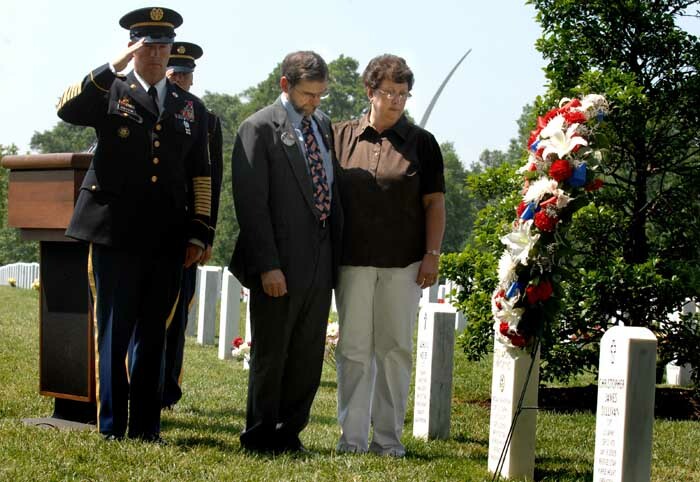 Hand in hand, Tom and Romayne McGinnis pulled away the blue shroud that covered their son’s headstone at Arlington National Cemetery, their last public act to cap a week in which their son was honored with the nation’s highest award for valor. The headstone marking Specialist Ross McGinnis’ final resting place now bears the distinctive emblem of the Medal of Honor, and the letters of his name glitter in gold. 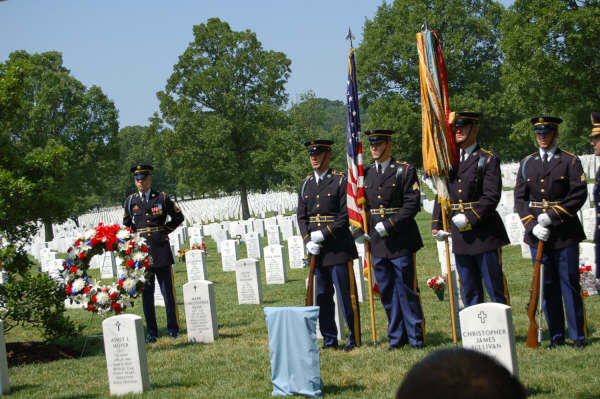 The ceremony Wednesday at Arlington was short and simple, attended by family, friends and the 19-year-old soldier’s brothers-in-arms. 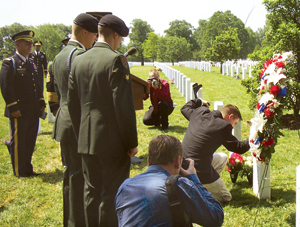 It was the last of three ceremonies to honor Ross McGinnis, who was killed December 4, 2006, in Adhamiyah, Iraq, when he smothered a grenade with his body. His actions saved the lives of the four soldiers in his Humvee. 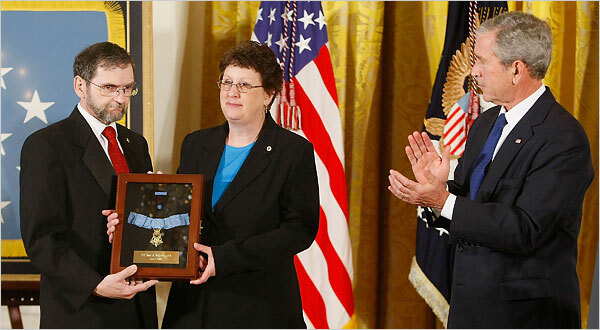 On Monday, President Bush presented Tom and Romayne McGinnis with the Medal of Honor at the White House. 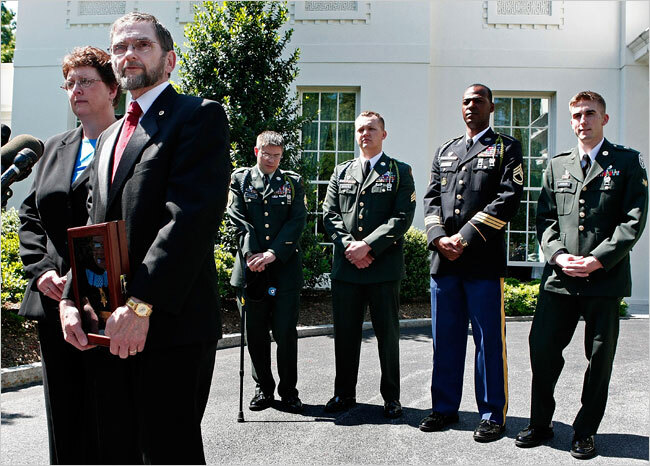 The next day, top Defense Department and Army leaders honored Ross McGinnis by inducting him into the Pentagon’s Hall of Heroes. “Long before that day in Adhamiyah, Ross proved his courage on his 17th birthday when he joined the Army,” Vice Chief of Staff Gen. Richard Cody said during the 45-minute ceremony at the Pentagon. 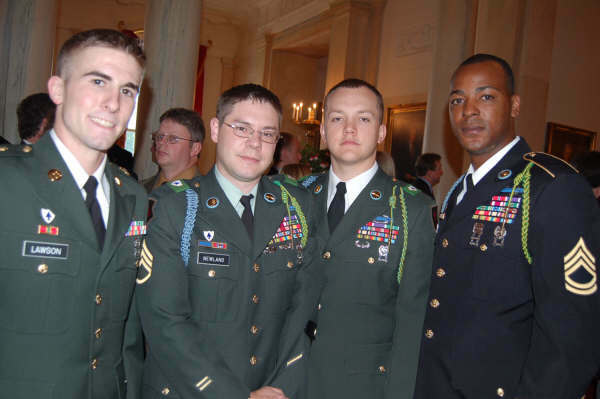 As McGinnis matured as a soldier and as his unit, 1st Platoon, C Company, 1st Battalion, 26th Infantry Regiment, prepared for duty in Iraq, the soldiers built “the kind of trust that turns strangers into brothers,” Cody said. “The crucible of combat only strengthened that trust,” he said. The four men who were in the Humvee with McGinnis — Sergeant First Class Cedric D. Thomas, now-retired Staff Sergeant Ian Newland, Sergeant Lyle Buehler and Specialist Sean Lawson — attended all three ceremonies this week. Tom McGinnis added that he and his family appreciate all the support they have received. 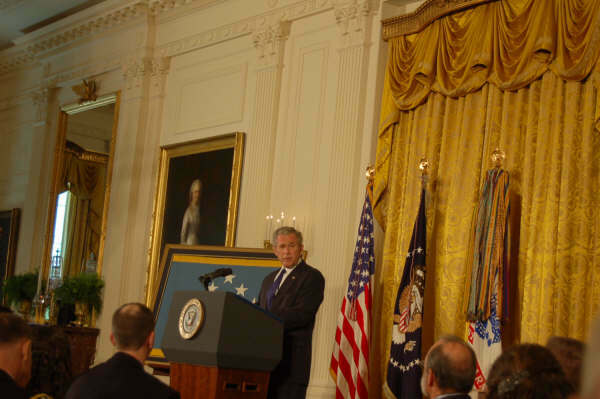 During the ceremony at the Pentagon, Tom and Romayne McGinnis unveiled a framed photograph of their son and the citation that accompanies his Medal of Honor. They also unveiled a plaque that lists his name among the other Medal of Honor recipients from the wars in Iraq and Afghanistan. The couple received a standing ovation when they were presented with the Medal of Honor flag, a light blue flag with gold fringe and 13 white stars that replicate the Medal of Honor ribbon. 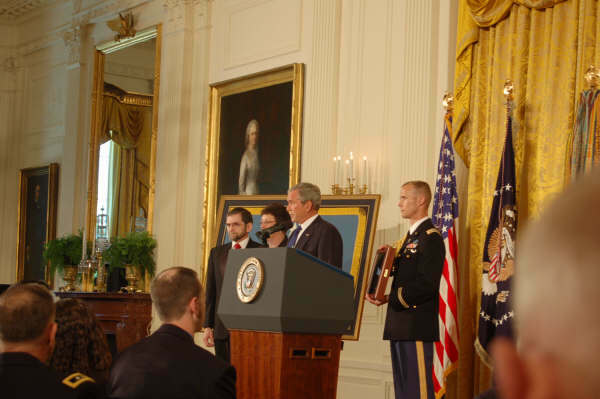 McGinnis is the second soldier to receive the Medal of Honor for actions during Operation Iraqi Freedom. Sergeant First Class Paul Ray Smith, who was killed April 4, 2003 fighting off insurgents in a fierce battle south of Baghdad, was awarded the Medal of Honor two years after he died. Two other service members have been awarded the Medal of Honor for actions in Iraq: Marine Corporal Jason Dunham and Master-at-Arms 2nd Class (SEAL) Michael Monsoor. One Medal of Honor has been awarded for actions in Afghanistan, to Lieuteannt Michael Murphy, a Navy SEAL. 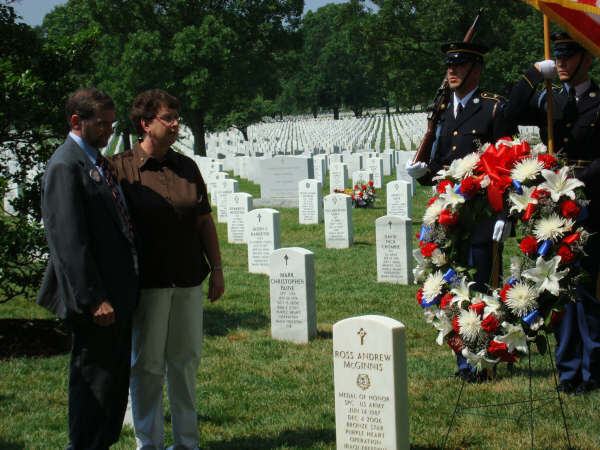 Sergeant Major of the Army Kenneth Preston and Tom and Romayne McGinnis, the parents of Medal of Honor recipient Specialist Ross McGinnis, unveil a new inscription on the Soldier's headstone in Arlington National Cemetery Wednesday. 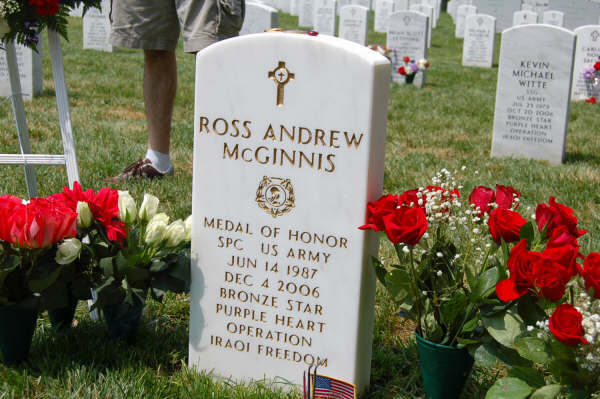 ARLINGTON, Va. (Army News Service, June 5, 2008) - Private First Class Ross A. McGinnis received the highest military honor possible Moday, the Medal of Honor, and on Wednesday a new headstone marking his achievement was unveiled at Arlington National Cemetery. While it threatened to rain, the sun broke through just before the ceremony. 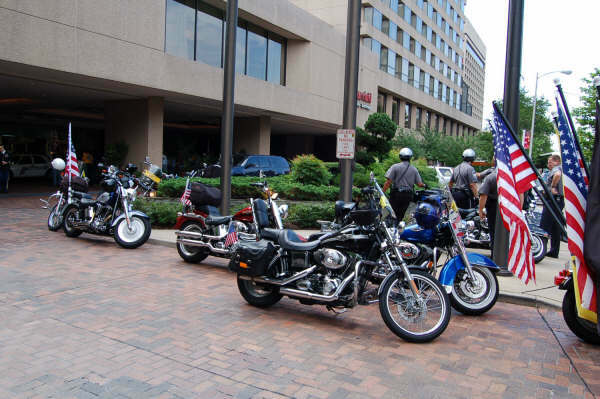 Members of the Pentagon Police and the Patriot Guard rode their motorcycles into the cemetery as a tribute to the fallen hero. McGinnis' parents and siblings were present for the unveiling, which included a speech by Sergeant Major of the Army Kenneth O. Preston. "This stone that we will unveil will remind [people] that freedom is not free, and that great Soldiers like Ross have died in defense of that freedom," Preston said. "This stone will give Soldiers like me - and those who aspire to wear the uniform of a Soldier - an opportunity to reflect on Ross's actions a year and a half ago." McGinnis was a machine gunner with the 1-26th Infantry, Ist Infantry Division, stationed in Iraq. 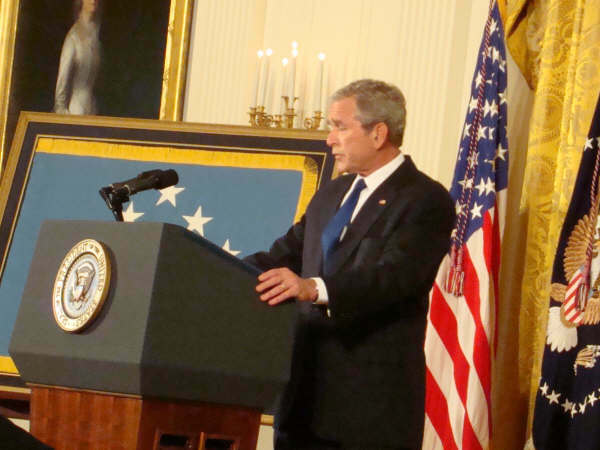 On December 4, 2006 his platoon was conducting operations to reduce sectarian violence in Adhamiyah. While he was manning the machine gun, a fragmentation grenade was thrown into his vehicle. Standard procedure is for the machine gunner to warn of the danger, and then jump out. McGinnis, however, saw the others wouldn't be able to evacuate the vehicle in time, so he released his strap, and placed himself over the grenade, directly saving four lives. 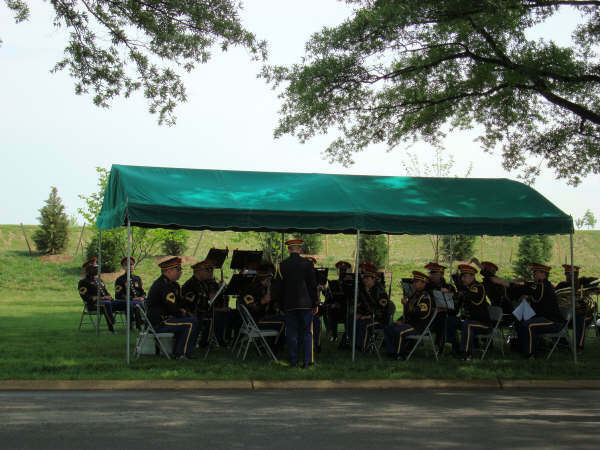 At his gravesite Wednesday, the Army Band (Pershing's Own) was present to play "Taps" and a solemn version of "Danny Boy" was played on the bagpipes as the stone was unveiled. Also present was Secretary of the Army Pete Geren; Lieutenant General David Huntoon, director of Army Staff; Lieutenant General Michael Rochelle, Deputy Chief of Staff for G1, Personnel; and Soldiers from McGinnis' platoon. Those attending the ceremony said they could not fail to feel respect for the young man who gave his life so four of his fellow Soldiers could live, and Preston's concluding words left that feeling in their hearts. 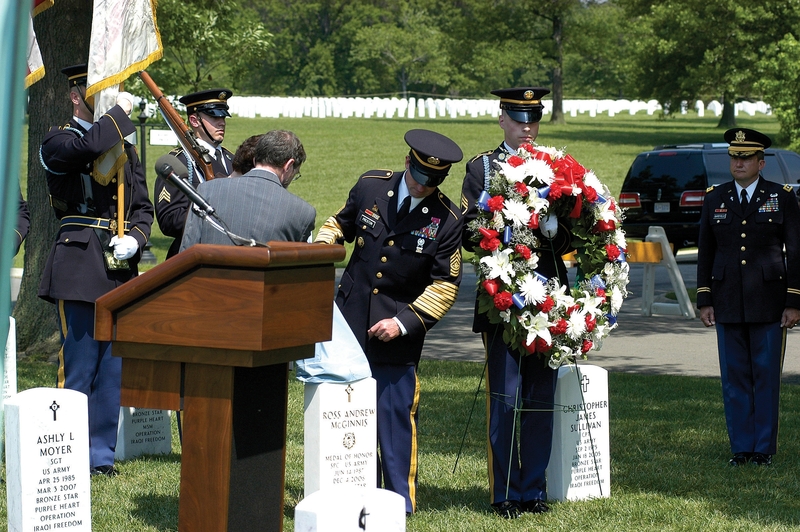 "It is because of his dedication that Ross solidified the very core of our Soldier's Creed ... The second paragraph of the Soldier's Creed is known as the Warrior Ethos. Ross epitomized that ethos on that December day in Adhamiyah." threw himself on a grenade that had anded in their Humvee during a mounted patrol in Iraq. 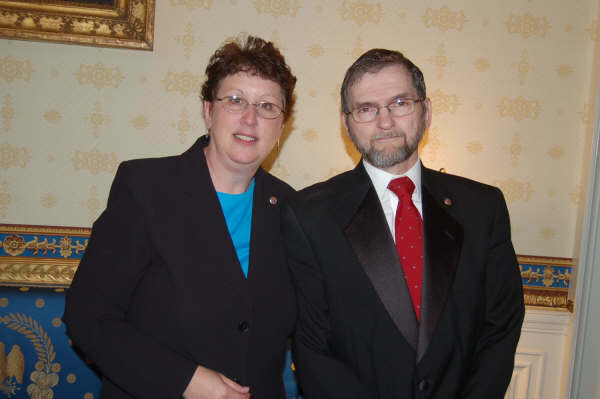 McGinnis received the Metal of Honor posthumously. 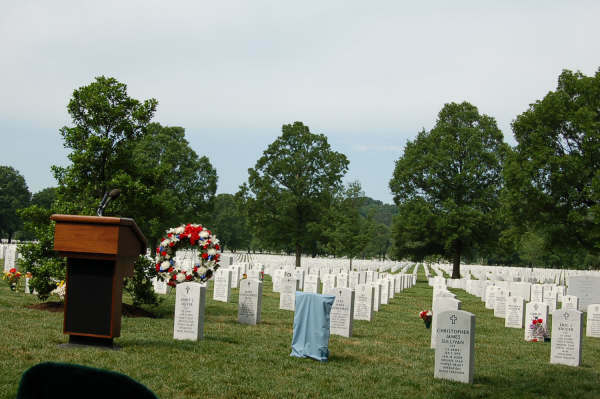 of their son during a ceremony June 4, 2008 at Arlington National Cemetery. 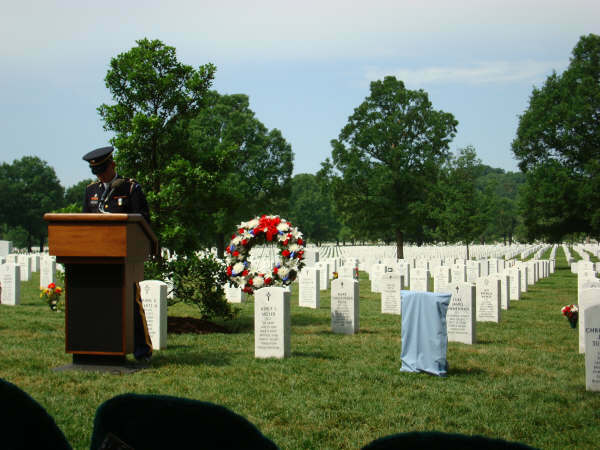 of Specialist Ross A McGinnis during a ceremony June 4, 2008, at Arlington National Cemetery. 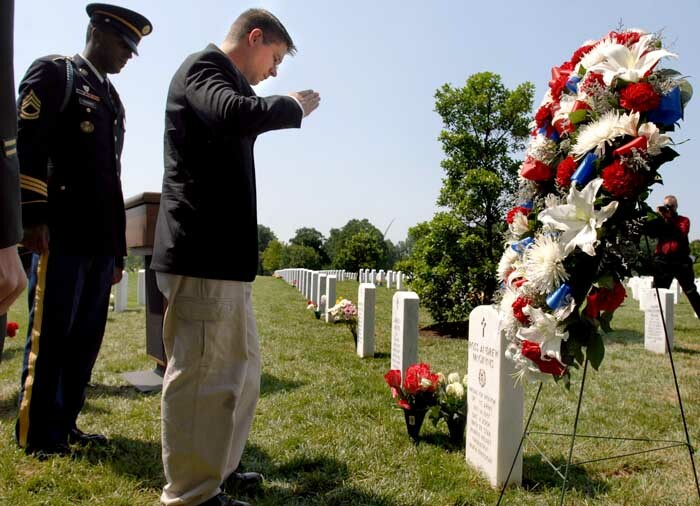 Sergeant Ian Newland kneels before the headstone of Ross A. McGinnis following a ceremony Wednesday at the Arlington National Cemetery. — are standing behind Newland.